The FHS Lady Indians Bowling Team defeated Sycamore 2371 to 1850. Making it 29 straight GMC victories. With the victory the Lady Indians clinched the GMC Title for the 3rd straight year. 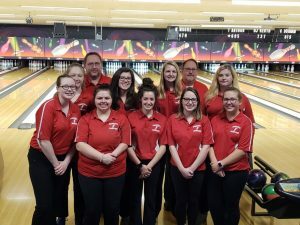 Leading the way for the Lady Indians Mikenlee Bowcock bowling games of 175 & 213 for a 388 series, Meaghan’s huffer with a 370 series, Lauren Zink with a 367 series and Lexey Baker with a 202 game. The FHS JV Lady Indians Bowling Team defeated Mt Notre Dame 2054 to 1620. Leading the way for the Lady Indians Haleigh Wallace bowling games of 171 & 179 for a 350 series, Lexie Lidd with a 187 game and Maddy Roybal with a 167 game. The FHS Varsity Boys Bowling Team defeated Sycamore 2530 to 2312. Leading the way for the Indians Austin Vanoss with a 429 series, Trey Baker with a 406 series and Darwin Russell with a 202 game. The FHS JV Boys Bowling Team defeated Sycamore 1926 to 1702. Leading the way for the Indians Jackson Bowling with a 333 series and Justin Smith with a 316 series.